Compact and simple to use the Baxi Duo-tec Combi 28 HE LPG condensing boiler is Rated A for efficiency with a SEDBUK rating of 88.6%. It features user-friendly controls and is a solution for households in off mains gas areas. Water is supplied via the mains and is heated when you turn on the hot water tap. Combi boilers are ideal for homes that don't have the room to house a separate hot water cylinder or cold water storage tank. The central heating temperature and hot water dials hidden behind a pull down flap are separate and can be set individually giving you greater control over your energy bills. Other useful features include a digital display panel that will display an error code if the boiler detects a problem. 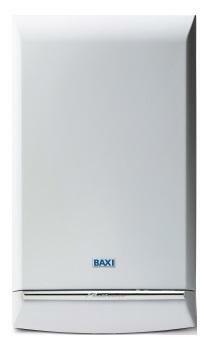 An Energy Saving Trust recommended boiler the wall-mounted Baxi Duo-tec 28 HE measures 78x45x35cm. It's compact enough to fit inside most standard kitchen cupboards.